The T-Bar Row is one of many exercises that exists for training your back for both size and strength. In this article, I’m going to be telling you about a bunch of alternative exercises that are just as good! But first, I’m going to tell you exactly which muscles the T-Bar Row targets. The focus of the T-Bar Row is your back. Your lats, teres major, traps and erector spinae are the main muscles at work whilst performing this exercise. Your biceps also play a role in this lift, as do your abs, hamstrings and glutes (due to the standing bent-over position). 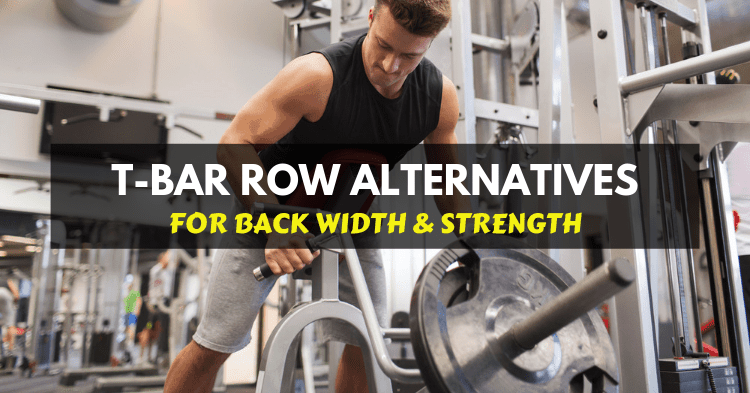 Here are some alternatives to the T-Bar Row that should be a part of your next ‘back and biceps’ day! Whilst not all these exercises target your abs, hamstrings and glutes (a lot of them do), the focus of the T-Bar Row is back – and for that, I have you 100% covered! Let’s start with the ones that hit your whole posterior chain. A classic exercise – the bent over dumbbell row exactly replicates the T-Bar Row IF you use a neutral grip. You can also do this exercise effectively with kettlebells. Have a dumbbell in each hand with a neutral grip. Stand with your feet hip width apart and place a small bend in your knees. Hinge about 45-degrees forward at your hips, maintaining a neutral spine. Start with your arms fully extended towards the ground. Row the dumbbells up towards your rib cage, your elbows skimming your sides. At the top of the movement hold and squeeze for a second before returning to full extension/starting position. The difficulty of this exercise will depend on the resistance band you use. It is a great variation of the standard row that provides constant tension in all phases of the exercise. Place a resistance band on the floor and stand on it with the middle of your feet with your feet just under hip width apart. Hold one side of the resistance band in each hand with a neutral grip. Note, you do not need to hold the handles, you can just hold the band if that offers you more resistance. Bend your knees slightly and straighten your back so that you have a neutral line from your hips to your head. Pull the bands up towards your rib cage/hips, your elbows skimming your sides. Pro Tip: This makes for a great warm up exercise with a light resistance band for 15+ repetitions at the beginning of your back and biceps workout. The supinated grip in this version of the bent over row places a bigger load on the biceps and helps build a stronger core too. 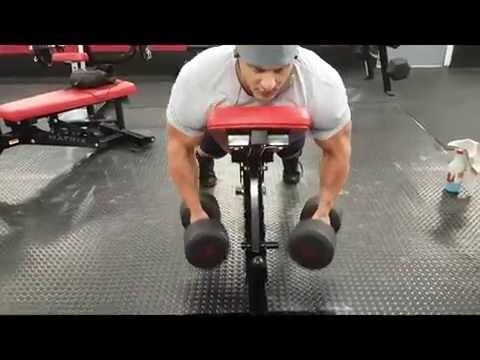 This is my all-time favorite back and biceps exercise and, in my opinion, the best alternative to the T-bar row. Hold a barbell (preferably an Olympic bar) with a supinated/underhand grip. Pull the barbell towards your hips, your elbows skimming your sides. This is another exercise that exactly replicates the T-bar row movement and is, therefore, a perfect alternative to try out. Attach a narrow grip handle to the bottom of the cable machine. Walk the cable out a few feet. Start with your arms fully extended toward the cable machine. Pull the cable up towards your hips/rib cage, your elbows skimming your sides. Set up an Olympic bar with suitable weight. Hinge forward at the hips to grab the bar with an overhand grip. Your hand placement should be neutral – in a straight line from your shoulders. Flatten your back to a neutral position before you commence the lift. Row the barbell up to the bottom of your rib cage and back down to the ground in one swift and powerful movement. Make sure you maintain a neutral spine throughout this exercise. Pro Tip: If you’re not at the stage of being able to put 20kg weight plates on the barbell for this lift, make sure you use bumper plates as to have the bar at the right height at its dead stop point. This lift significantly increases your upper back strength, as well as your grip strength. 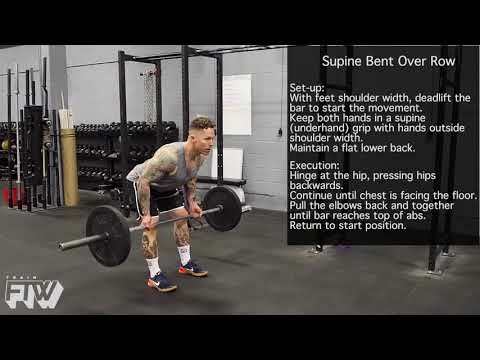 If you’re looking at increasing your overall deadlift, this is a great exercise to get you there. Doing Kroc Rows without straps will give your forearms a solid workout too! Have a dumbbell in one hand. Stand with your non-working arm placed on something solid that allows you to have your shoulders higher than your hips and your upper back at the correct angle (+-15-degrees to the floor). Start with your working arm fully extended towards the ground. Pull the dumbbell up towards the lower portion of your ribs in an explosive movement, but without creating too much momentum. Allow your arm to go to full extension on the way down, lowering your shoulder towards the ground as to feel a stretch through your rear deltoids and lats before heading into your next repetition. The chest supported dumbbell row is beneficial for improving shoulder health, posture and building strength in the upper back and arms. This makes it a reasonable alternative to the T-bar row which does all these things too. Set a bench to 35-degrees. Have a dumbbell or kettlebells in each hand and straddle the bench, leaning your chest against the backrest. Your chin should be above the bench and your feet on the floor. Start with your arms fully extended towards the ground and then move them slightly forward (for maximum range) before commencing the row. At the top of the movement, draw your shoulder blades together and hold and squeeze for a second before returning to full extension/starting position. This exercise still requires stabilization on your part, but from the core rather than your glutes and hamstrings. If you’re intending on lifting as heavy as possible, this is not the exercise for you. The exercise ball narrow grip row is best for high repetition, mass building and conditioning, as opposed to developing optimal strength. Attach the narrow grip/close grip handle to the cable machine at about waist height (seated on the exercise ball). Walk the cable out and sit on the exercise ball with your knees bent at 90* which will require maximum core stabilization. Start with your arms fully extended towards the cable machine. Pull the cable towards your stomach, your elbows skimming your sides. Squeeze your shoulder blades together and hold for a second or two. The eccentric phase of this exercise should be slow and controlled. One of my favorite exercises for developing balanced strength through the upper and middle back is the ISO-lateral row. The added support of the machine means you can capitalize on the weight you use. Make sure the seat height is appropriate for you – the chest pad should align with the middle of your chest. Ensure that the chest pad is set at the right distance from the handles – you should have to stretch to grab the handles. If not, you will fall short in range. Grab a handle in each hand and, whilst keeping your chest firmly against the chest pad, pull the handles all the way back towards you. Your elbows should go straight behind you and your shoulder blades should come together. Hold and squeeze for a second before returning to full extension/starting position, creating a stretch through your rear deltoids and lats. Don’t let the weight plates touch at the end of the movement – you should always maintain tension. Pro Tip: If the ISO-lateral row machine you are using has adjustable handles, hold them at 45-degrees (away from the machine) to hit your lower lats hard. The seated cable row never goes astray in a back and biceps workout. 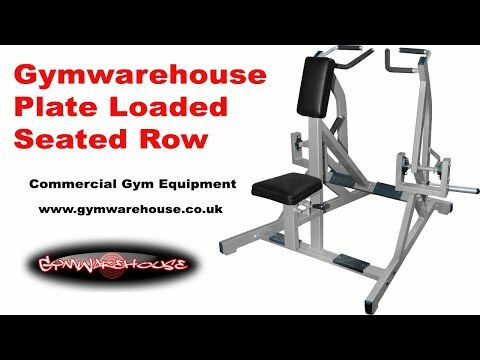 If you don’t have access to a landmine attachment or are unable to perform a T-bar row, the seated cable row will suffice. Good old faithful! Attach a close grip handle to the machine to best mimic the T-bar row movement. Sit on the seated cable row machine with a small bend in your knees and lean back about 20-degrees at the hips. Have your arms fully extended for starters. Retract your shoulder blades before you start the row movement and do this for each repetition! Maintaining the position of your back and hips, pull the cable towards your lower rib cage with your elbows close by your sides. Hold for a second at the end of the movement and concentrate on moving slowly through the eccentric phase. Pro Tip: Keep your shoulders down throughout to avoid getting your traps involved in this exercise. This one is a compound exercise that not only targets your lats, but your entire back and your arms. This makes it a great option for when performing the T-bar row is not possible. Attach the narrow/close grip handle to the lat pull down machine. Sit all the way in the machine and extend through your thoracic spine (i.e. push your chest out without hyperextending through your lower back). Engage through your lats before initiating the pull (on each repetition), then pull the handle down to just above your chest. Hold here for a second with your elbows tucked in tight. Return to starting position slowly, allowing your arms to go to full extension, creating a stretch through the lats. For training upper back, one cannot look past the inverted row. T-bar row or no T-bar row, you should be doing inverted rows, regardless! You can use a smith rack OR a free barbell in a power rack for this exercise. Set the bar at waist height. Grip the bar (overhand) just over shoulder width apart. Position yourself under the bar on fully extended arms. Your body should be in an engaged, straight line from your feet to your head. Pull your chest towards the bar whilst retracting your shoulder blades. Once your chest reaches the bar, hold the position for a second. Lower your body back down to starting position in a slow and controlled manner. Do not flop down! Pro Tip: This is a great finisher exercise to do until fail! If you dare! The T-bar row is a great exercise, but as you can see, there are plenty of other equally effective ones that can be done in its place. It’s important to keep in mind, that although the T-bar row is a powerful and demanding exercise, it cannot be safely performed by everyone. The T-bar row requires a great deal of mobility and core strength/lower back strength to be performed effectively and without putting yourself at risk of injury. 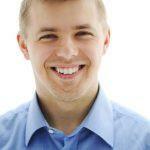 Therefore, it is a good idea to consider some of these alternatives. Not only if you lack mobility, but also to spice up your back and biceps routine and hit your back from all angles! What do you like to do instead of the T-bar row? Let our readers know in the comments section below!